I have finally got around to releasing the original WebRevolutionary theme. I am calling the theme Revolutionary. Revolutionary is focused heavily on bringing a more readable and minimalistic feel to a blog, and allow for more flexibility. 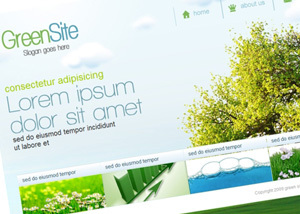 Clean Layout – Clean & simple layout the is perfect for a minimalist structure. Compatibility – Compatible with previous and latest WordPress version 2.8.5. Compatibility is an important factor as it is the ground of your site and must be ready to serve further WordPress engine updates. You also receive our free updates for the theme during the life term. After unzipping the package please refer to the Revolutionary_Guide.doc located in the /themes/revolutionary/ folder for complete install and setup instructions. 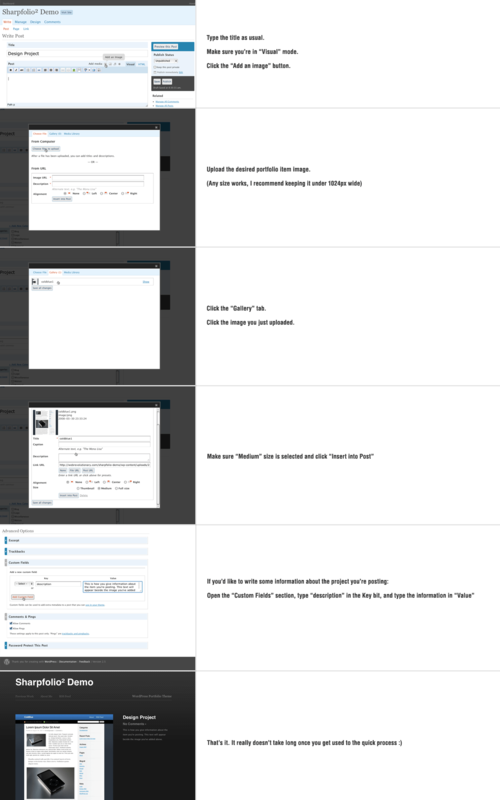 If you have any issues with the theme or you have found a bug…just leave a comment and let me know. 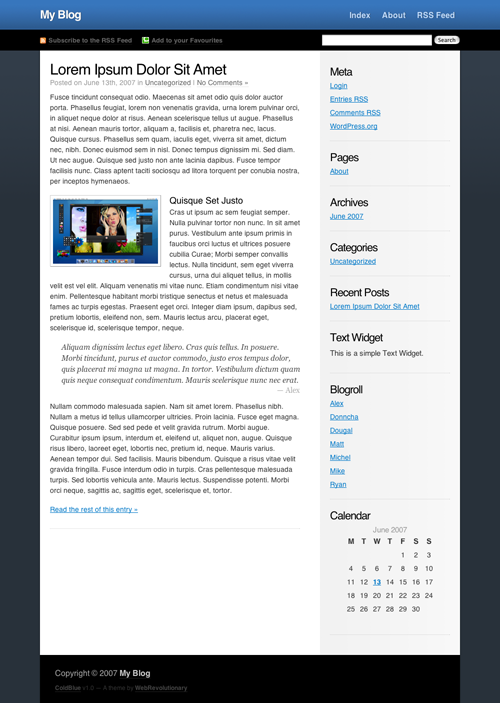 ColdBlue is a WordPress Theme created to be aesthetically pleasing, open, minimalistic and easy to use. It is absolutely free to download, however if you enjoy the theme please be considerate and leave the link intact. This courtesy will go towards further development of ColdBlue and future themes (which will always be free). 1.0.3 Fixed: “Bigger child” font-size issue. Only affected nested categories in sidebar. 1.0.2 Modified: Screenshot and Theme directory name. 1.0.1 Fixed: Technorati “Add to your Favorites” link. en-us spelling and href. Updated to conform with the latest version (2.8.4) . Also theme provides a 4-page install and configuration document. So if you’re not totally convinced yet, have a look at the Live Demo. After installing Sharpfolio (WordPress 2.5+ is highly recommended), you must go to the Settings page of your WordPress Dashboard, then the Miscellaneous panel. 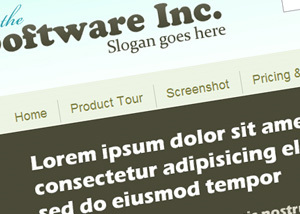 Set the Medium Size to 500px wide and 800px high. This will ensure that the images you post appear nicely in your portfolio. Install and configuration instructions included in download. It’s a little different to posting in a normal blog. I seriously recommend reading these instructions on how to post projects in your portfolio. This work is licensed under a Creative Commons Attribution-Noncommercial 3.0 License. If you like my work, then tell your friends! If you have any issues with the theme, have found a bug or want to abuse me about something, scoot over to the contact page and drop me a line. 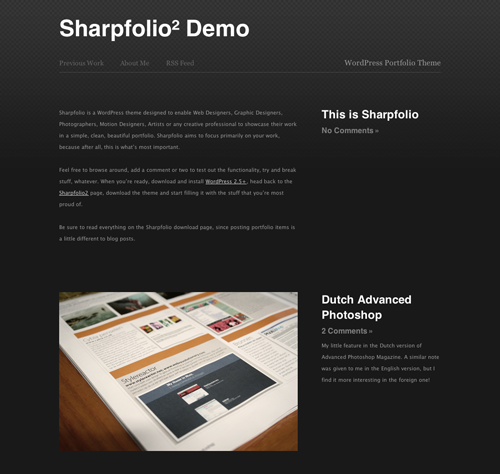 Sharpfolio is released and developed free of charge, but it still takes time and money. If you find it useful, please be courteous and leave the link to the theme intact. Sharpfolio is released and developed free of charge and will be continually improved and updated, so make sure to subscribe to the RSS Feed to stay up to date.